Listening To Real Paranormal Talk Radio At It's finest! The internet today is a buzz with the sounds of paranormal uttering's and musings via the world wide web. Lets just basically say you can now a days tune in and listen to who you want when you want. And might I just recommend the team of "Brian Leffler, Scottie Stamper, Joel Sturgis" they collectively make up the driving force behind Shadow Talk Paranormal Radio. And what a team they certainly are. The shows are a virtual Who's who of all the paranormal people in the community worth investigating. And they tend to ask the right questions. Personally I can't wait until they invite me to be on the show, I know I will be as giddy as a school girl. Also check out their sister site Ontology TV, once again the intensity and strengths of Brian Leffler, Scottie Stamper, Joel Sturgis and also featuring the ghost hunting talents of Christie Rose, and Kyle Bruzenak transfers well to video. Together with strong video documentation and presence, Leffler and his team are "Keeping the Real in reality TV! " And remember Ontology TV brings it all clearly right to you, "The Real...Raw...investigations". 1. Faked Evidence and re-enactments on paranormal shows muddying the water between reality and showmanship. 2. We got really tired of people running away scared in these shows, after all, they are supposed to be the professionals. Our first episode "The Ghosts of Eveleth's Past" is filmed in one of Americas most haunted locations. This location is one that would hold its own up against Waverly, The Stanly Hotel, The Winchester House and even Eastern State. We were fortunate to discover this location and have been fortunate on numerous return trips to have encounterd regularly, Footsteps, Orbs with the naked eye, Voices, Shadows, Doors Closing and even Full-Bodied Apparitions. Bear in mind that these things are the norm and not the exception. These things are very common place and can spoil an investigator for investigating other locations. We have some fantastic episodes upcoming also. We are looking at filming on board a ship, in a transportation museum with a ton of history, a private home that used to be a hotel as well as a brothel that sent an investigator from another team screaming and running away! We use the tag line Real...Raw...Investigations for a reason. That is what the show is and nothing more. It is the genuine article where people are able to see what real paranormal investigation is really like as opposed to just a few people running around pretending and being scared. Ontology TV, putting the Real back in Reality TV!! As a well acknowledged paranormal investigator for many years. Brian Leffler began is his journey as a skeptic. Then he moves into a real haunted house. He can personally tell you of the many paranormal experiences that eventually cracked the hardened shell that is hard-nosed skepticism. He began to study the paranormal he had and how it lead him into becoming a paranormal investigator he is today. He is also a member of the Northern Minnesota Paranormal Investigators. Leffler is also a respected an author, being published on the Internet, in Fate Magazine and his own vest selling book called "Ghosts: Minnesota's Other Natural Resource." published by Schiffer Books 2007. His book is one of the best reads I have had in a long time. The book is actual case-files of the Northern Minnesota Paranormal Investigations. That Leffler actually participated in the investigation of the phenomenon. His direct style actually makes you want to get out the EMF meter and start hunting right away. "Ghosts: Minnesota's Other Natural Resource." published by Schiffer Books 2007. Buy it here now! Real firsthand encounters of paranormal experiences are related straight from Minnesota's most haunted places. • Visit the actively haunted Lakeview Cemetery where the Potter's Field for Shaw Hospital was born. • Interact with a ghostly potato garden spirit who resides at Moon Lake. It makes rounds through the house that sits on its grave. • Eavesdrop on a paranormal investigation at Union Depot, where a bodiless apparition moves between train cars. • At the haunted Grand Marais home, singing star Barry Cowsill roams with other ghostly souls. Gather tips from a first-rate investigative team, the Northern Minnesota Paranormal Investigators, who will take you through some of the best ghostly hangouts in the country. Minnesota's ghosts will haunt you. 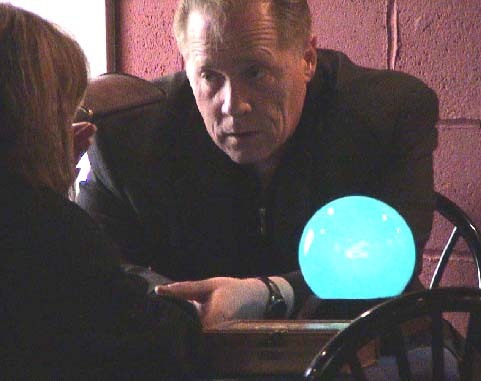 Leffler approaches the paranormal activities he encounters with a direct and unique approach. As a Radio Talk Show host his voice and personality comes across as someone that loves to conduct interviews. Brian is also a public speaker and is a member of the Robbie Thomas Team and he hopes that you will be watching for the Robbie Thomas Tour to come to your location so that he will have a chance to meet his listeners. What he is most proud of are the advances that he has contributed to in the field of paranormal research such as finding proof that not all orbs are dirt but in fact, a small percentage of them are actually spirit related! Please also see: 20 Questions with Brian Leffler here! Scottie Stamper's paranormal interest and adventure began when he was in his mid teens. At age 15 Scottie had his first run in with a full blown apparition. After recovering from this initial shock and scare, he decided to look into those moans and groans that frighten all of and go bum in the night. Well still as of today after numerous scares he is still trying to figure out just what real paranormal activity really boils down to. Scottie and his lovely Wife Rebecca currently operate "The Ghostville Times" web site "www.ghostvilletimes.com". Together they investigate paranormal phenomena and strange activities and do articles on paranormal topics and other paranormal investigators who spend their weekends and late nights trying to prove or disprove the existence of ghosts and the paranormal phenomena in the world around us today. “When I can honestly provide you with conclusive paranormal proof that I myself can’t disprove, I will then tell you yes there are paranormal forces all around us but for now I still have to say Orbs-R-Dirt”. Please also see: articles By Scottie Stamper "Why does everyone want to be a Paranormal Investigator?" "Have we lost our perspective of just what it means to investigate the paranormal?" And " Maybe its not really a Ghost" Here! The Ghosts of Eveleth's Past!! Joel Sturgis has been researching the paranormal for over 15 years. He grew up in a haunted house in Northern MN. That sparked hi interest in the paranormal to find out more about the world of the paranormal that we just don’t understand. Joel is married with two great boys Matthew 3 and Cody 8 and a proud member of the Northern Minnesota Paranormal Investigators. Sturgis has been studying the paranormal for more than 16 years. He grew up in northern MN a small farming of Aurora. Sturgis had hi s very first paranormal experience at the age of six. He saw and wittnessed what some call a shadow person on the second floor of the old farm house he lived in. Many, many years passed and he grew more and more interested in the paranormal. Sturgis started studying works by such authors like Brad Steiger and Hans Holzer and the Warrens. There where no groups in his area at the time so he started experimenting what he read on his own in such places as cemeteries and other public reported to be haunted locations. As he truely honed his skills as a paranomal investigator. He researched and went to such real haunted places as Atchison Kansas and Dodge city Kansas. And in time began investigating for haunted indiviusals and families and as of today he continues to help with haunted families in paranormal crises. Brian Leffler and Sturgis met and became fast friends. Share share alto of the same views and opinions on the paranormal. Sturgis joined NMPI (Northern Minnesota Paranormal Investigators) founded by Brian Leffler. Later he was asked to join the shadow talk paranormal radio team." I love coming on shadow talk and talking with the biggest names in the paranormal." :" The fans are what keeps the wheels turning." States Strugis. So then next time you need your paranormal fix tune and and be turned on to one of the best internet talk and haunted radio show on the internet. I promise you you will be haunted too!